The Havanese is a small dog covered in long wavy or curly hair. His tail is carried curled over his back. The Havanese ranges from 8 to 11 inches (20-28 cm). The Havanese weighs 7 to 13 pounds (3-6 kg). The Havanese comes in many colors including cream, gold, silver, champagne, tan, blue, black, parti-color and tri-colored. The Havanese has a long whispy coat that tufts out towards extremities. The Havanese is gentle, responsive and enjoys pleasing people. They become very attached to their families. Havanese are social and cheerful and get along with everyone including dogs, cats and other pets. This breed is very affectionate and intelligent and it learns well. Though an overall healthy breed, the Havanese are prone to progressive retinal atrophy, cataracts, luxating patellas, poodle eye and dry skin. Havanese can be expected to live 14 to 15 years. The Havanese does well living in an apartment and can do well with a moderate amount of exercise. The Havanese is in the Toy Group. The Havanese is a descendant of the Bichon family which originated in Cuba. It is the only native Cuban breed recognized by the American Kennel Club, and is actually featured on some Cuban postage. 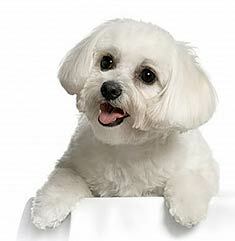 Similar dogs have been referred to throughout history as the Petit Chien Havane, the Blanquito de la Habana, the Blanquito Cubano, the Havanese Silk Dog, and the Bichon Habanero. This dog is also often called the National dog of Cuba. What does a Havanese look like? The Havanese is small and sturdy with long wavy hair of any color that falls all the way to the ground. The hair is protective against the tropical heat of the islands and should never be shaved. The hair of both the top coat and the undercoat should be soft and light; never harsh or woolly. He or she carries his tail over his rump, and often wears his or her hair in a top-knot to keep it out of the eyes. The Havanese stands from 8.5 to 11.5 inches tall at the shoulders and weighs 7 - 13 pounds. A dog who meets the breed standard will be playful and alert with a lively, elegant walk. Dogs who have docked tails, cropped ears, clipped fur or even a hairstyle that includes a top-knot cannot be shown in conformation trials. The standard calls for this breed to be shown in his or her natural state. With all of this fur, what about allergies and grooming? Although the fur is quite long, it is not routinely shed and does not contribute to allergies. However, the hair does catch dander, requiring daily brushing to remove the dander. Havanese are less likely to cause allergic responses than many other breeds, but no dog can truly be said to be non-allergenic. In fact, allergens are carried even in the saliva of the dog, not just on the fur. To groom a Havanese, lightly mist the dog with a de-tangling spray to prevent hair breakage. Pin up the top several layers of the coat, then brush out the bottom layer, starting from the bottom of each hank of hair and working your way up to the end of the hair coming out of the dog's skin. When one layer is complete, use a fine metal comb to remove any remaining knots or mats. Take the next layer down from the clips and mist, brush, then comb that layer before continuing on to the next. The hair around the foot pads should be trimmed periodically to keep the pads from splaying out and to give the dog's feet a rounded appearance. Hair inside the ear canals should be plucked to allow cleaning of the ear canal to ward off ear infections. When your puppy is quite young, put a small amount of petroleum jelly at the inside corners of both eyes. This will keep the fur from growing towards the eyes and irritating them. Eventually, the hair will be trained to grow in the right direction and further treatments will not be necessary. However, Havanese are prone to tear-staining around the eyes, which should be cleaned daily using a warm wet washcloth. Can I let my Havanese play outside in the winter? Having been bred on the tropical island of Cuba, the Havanese is definitely a warm weather dog. Although this breed has that beautiful long coat, the fur's composition is not suited to providing warmth. Rather, the purpose of the fur is to provide shade from the hot sun. Although some heat can be trapped between the layers of hair and provide a bit of protection against the cold, the dog is not well-suited to playing outdoors for long periods of time in the winter. Taking short walks or going outside long enough to take care of business is acceptable for the Havanese. 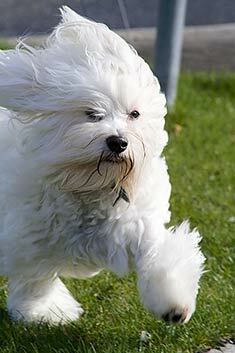 Another consideration for your Havanese while outdoors is his size. If you live in rural areas where there may be predators such as coyotes and hawks, your active Havanese will appear to be the perfect prey. Make sure you stay outside with your Havanese to watch for any wild animals that could scoop him up while looking for a snack. Most Havanese are generally healthy, but they are at risk for a limited number of genetic diseases including cataracts, cherry eye, chondrodysplasia, deafness, hip dysplasia, Legg-Calve-Perthes Disease, liver shunt, and patellar luxation. Cataracts in dogs are the same as they are in humans, a clouding of the lens of one or both eyes. When you are looking for a puppy, ask to see a recent certification of eye health of both parents from the Canine Eye Registration Foundation (CERF). Cherry eye occurs when the tear gland in the corner of the eye becomes inflamed after it begins to stick out from behind the dog's third eyelid. Surgery is required to put the gland back where it belongs. Chondrodysplasia, one of the diseases that causes dwarfism in humans, is sometimes found in Havanese dogs. Some breeds, such as the Basset Hound, are actually bred to have chondrodysplasia to keep them short. Havanese should not be bred for this quality, but they sometimes are. If the defect is not the same on both sides, your dog will appear to be crooked and may have trouble walking correctly. Surgery within the first year of life may be required to correct the problem before the bones are fully developed. Deafness is tested by means of a Brainstem Auditory Evoked Response (BAER) test, which checks the level of hearing in each ear independently. When you interview breeders, be sure to ask if they have BAER testing results from both parents, as well as from the puppy in which you are interested. Responsible breeders will refrain from breeding a dog with even partial deafness. Hip dysplasia occurs when the hip joint's bones and ligaments are loosely fitted together. Because the bones slide abnormally on each other, arthritis presents at a very young age, causing your dog great pain and lameness. Two X-ray studies are available to determine if a dog has hip dysplasia, and your breeder should be able to show certification for both parents, either from the Orthopedic Foundation of Animals (OFA) or the Pennsylvania Hip Improvement Program (PennHIP). Legg-Calve-Perthes disease also affects the hip joints of young dogs when the ball portion of the joint begins to die because of a poor blood supply. If your puppy begins to limp between the ages of 5 and 12 months, have your vet do an X-ray to check for LCP. A liver shunt occurs when the dog's blood vessels are malformed, allowing some blood to bypass the liver as it circulates the body. Without a pass through the liver, the blood will not be cleaned of toxins like ammonia. The dog may become disoriented and show weakness and poor balance. He or she may become blind, have seizures, or drop into a coma. His or her kidneys may begin to shut down. A special diet can cut down on the amount of ammonia that builds up in the blood, but the definitive cure for a liver shunt is surgery. Like many small dogs, Havanese may have trouble with patellar luxation, where the kneecap slides out of position. Surgery may be required to re-anchor it in the proper spot. Is the Havanese the right breed for me? This cute-as-a-button dog is mischievous and playful, a combination that often adds up to trouble. What you see as a completed report for your boss, your Havanese may well see as a pile of papers asking to be torn up. They love to run through your home and may create havoc when they do so. The dog does well with children and other pets, but must be watched carefully when outside to avoid being snatched by predators. Havanese like to be in high places, so you may find your puppy curled up on top of a couch or chair. If it would bother you a great deal to find a dog sleeping on your dining room table, you may want to look at other breeds. Not known for excessive barking, the Havanese does have a large repertoire of vocal sounds including grumbles, groans, and howls. The Havanese is relatively easy to train and often participates in sports such as agility and flyball. If you are planning to show your Havanese, be prepared for the intense grooming requirements, although if you are looking for just a pet, there is nothing wrong with keeping your dog's hair in a puppy clip, where all of the hair is kept about one-to-two inches long year-round. Find Havanese Puppies with our Free Breeder search!